I’ve just heard about RVillage and signed up for it. It’s a way for fellow RVers to get in touch with each other and for you to see who is in the RV site where you may be. I like the idea of seeing other people who might be in your campground before we meet them, but it seems strange to me. What do I do? Just start wandering the campground calling the name of fellow RVillagers? I like the idea and I think it’s a great idea to do meet ups, though. I’m giving it a try and I hope you do as well. Then all my best friends will be signed up and ready to roll! This is a GREAT video from RV Travel about a two story trailer. Her father built a second story onto a 1955 Spartan. She lived in that trailer from the time she was three years old until she went away to college in 1969! Her family traveled all over in that trailer and her parents lived in it until they died! 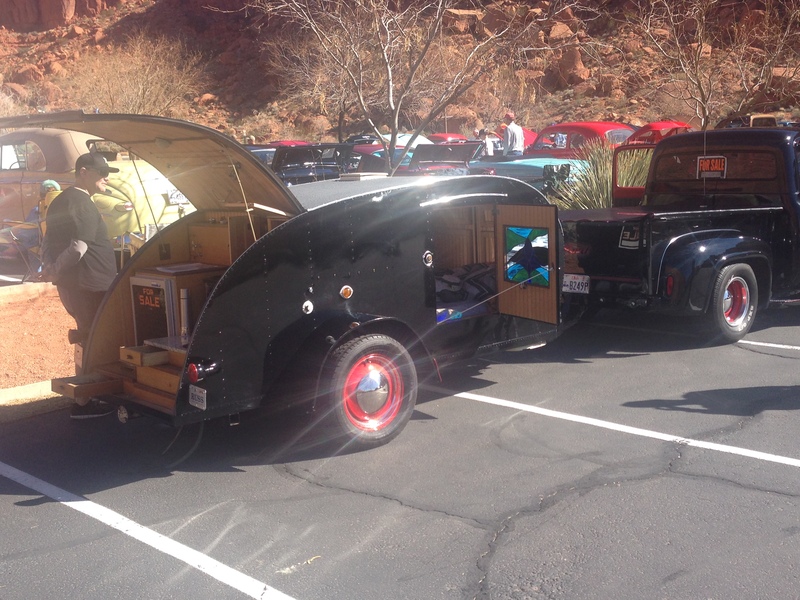 My father-in-law sent me this photo of a teardrop trailer and matching retro truck that he saw at the Tuacahn Saturday Market. Click the photo to see the full-sized version. It had a for sale sign on it, but they didn’t ask how much it was going for. I just love seeing these retro teardrops!